My Home and Garden: Well, now I've seen it all. Something out the window caught my eye first thing this morning. 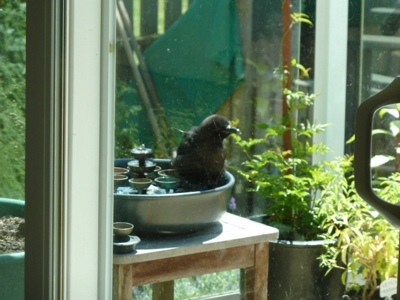 I looked out to the deck and was really surprised to see this big crow sitting in my Waterbell Fountain drinking from the centre bell waterfall. I grabbed my camera and clicked this as fast as I could and then he flew away. I have had this fountain for about 8 years and I've only had bees drink out of it. It really made my day. I dream about crows often so I have a soft spot for them. It looks like it might be a fledgling Erin. Hard to tell though. How lovely. Birds bring so much joy but sadness too, as we saw a hawk fly through and grab one of our gold finches yesterday (((. The Captain said...hawks have to eat too. Too funny! I'll bet he's thinking, "Wow, this water must be something special as my ears are ringing!" LOL! I hadn't thought of that. Your Captain is very sensible. I would still be freaking out about the baby bird.....but he is correct. Ting...splash, splash....ting. It really is a cool fountain. Now they come with a copper bowl. Mine is a ten year old version. It is a dark grey ceramic bowl. Really heavy. I love it. That is too funny! The fountain is beautiful.....I guess it's admired by the feathered friends too!